Easy to read, but the navigation buttons are a little stiff and unresponsive. 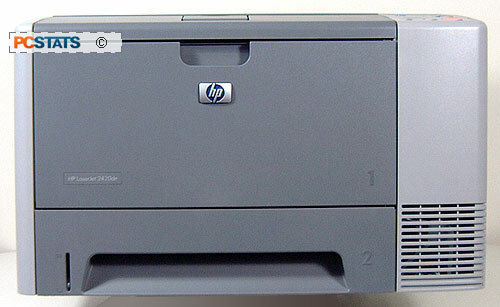 The HP LaserJet 2420dn is a very 'businesslike' printer in appearance, for lack of a better way to describe it. The printer is a nondescript beige and grey box with pastel buttons. 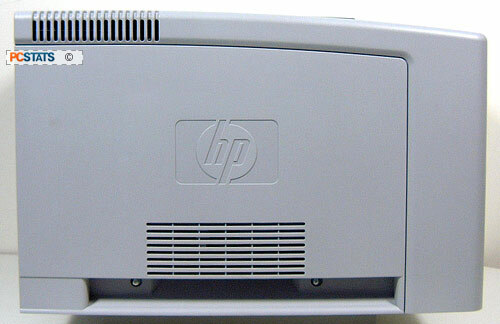 Wholly inoffensive and unremarkable, just as we've come to expect from HP and business printers in general. It's not going to turn heads in your office, but why would you want people looking too closely at your $1000+ printer anyhow? On the control panel, a snazzy backlit monochrome LCD shows printer status info and the setup menus. Now let's take a moment to explore the physical features and characteristics of this printer so that you'll know what to expect. The front of the 2420dn contains both paper trays, numbered here (1) for the multipurpose pull out tray and (2) for the 200-sheet paper cartridge. Both are easily opened and adjusted. 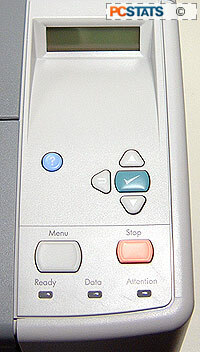 A plastic paper tray status meter is located on the bottom left, which will slowly move towards empty as you use up the paper in the tray. The only other front feature is the ventilation fan. Nothing of note here, besides another cooling vent and a hand-hold for lifting the printer.